As I mentioned in my last post, I'm sitting on some excess cash and need to invest it for a higher return than the 2.3% it's currently earning. I decided to look at my portfolio and determine how much rebalancing I need to do. I was quite alarmed when I looked at my portfolio. Over the past year, I dumped a few poor performing expensive mutual funds in favour of some stocks which have been performing well over the past year. It left with me with almost 90% exposure to the Canadian markets. Most of the run-up in my cash holdings have been the result of my savings over the past couple of months. It's clear that I have way too much cash and need some foreign exposure. For now I've narrowed my focus and will put my excess cash into US equity - preferably large cap. I'm looking at some index funds, ETFs and a few stocks, but am leaning toward ETFs for their instant diversification with low MERs. I also need to re-evaluate my remaining funds since the funds recently went through a reorganization. Canadian Capitalist mentioned TD efunds and I think these may be a good fit for what I want. 2. If stock, 2-3% yield; if income trust 5-8% yield. 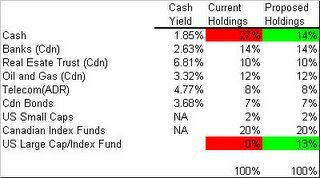 I'm a strong proponent of cash yields, whether it's dividends or trust/fund distributions.